Memorial Day is over and that signals that summer is here, and that traditionally means vacations...and that means a roadtrip to me! For many people, it also means hauling a travel trailer down the road, sometimes on their own, and sometimes in a caravan of shiny Airstream trailers like this group. I’ve never wanted to deal with a trailer: backing into tight spaces, emptying the waste, etc. But there have been a few trips where I had my car packed to overflowing and a trailer would have been helpful! Airstream founder Wally Byam built his first trailer in 1929, but it wasn’t anything we would recognize as an Airstream. It was a tent contraption built on a Model T car chassis. As it had some problems in the rain, he soon replaced the tent with a teardrop-shaped permanent shelter and began adding other conveniences such as a stove and an ice chest. Folks started asking him about it and he decided to build trailers for sale. By 1931, Wally was building the Airstream Torpedo Car Cruiser in a factory, along with nearly 400 competitors, as the trailer lifestyle exploded. World War II halted production, as you could not buy aluminum because it was all needed for airplane production. But the business reopened after the war and trailers were soon on roadtrips all over the country. Besides the Airstream, some of the well-known brands of the postwar period that we could have purchased in 1962 included Winnebago, Avalon, Fleetline, Holiday House, and Aloha. Many were built in the popular “canned ham” style, so-named because of the resemblance to a popular way to buy hams at the time. Many were regional manufacturers, such as Aloha, which sold mostly in the northwest from their plant in Oregon. Or, maybe your roadtrip takes you to the lake, so you need a boat. Our year 1962 had plenty of boat brands to choose from, including Starlite, Aristo-Craft, Glastron, Crestliner, and Chris Craft. Most were aluminum or fiberglass, but there were a few wooden boats still being built. Every style was available from a small, two-person fishing boat to a yacht fit for the Kennedys. The 20-foot Empress shown here was billed as “family size”, and boasted an enclosed cabin with Philippine mahogany in the front and an open cockpit in the rear suitable for lounging or fishing! It was available with either inboard or outboard motors. I couldn’t find any roadtrip themed covers for June, but Sugar and Spike are on vacation at the beach. The two lead characters of this comic were Sugar Plumm and Cecil "Spike" Wilson, a pair of toddlers who were not old enough to talk and could barely walk. The pair, which has Sugar as the brains of the duo, is incredibly cute. They typically get into trouble with the grown-up world, but manage to solve things despite their baby understanding of things. The writing and art were always by Sheldon Mayer, whose creations were popular enough that he negotiated a deal with DC Comics that no one else would be allowed to write the strip. The series ended in 1971, when Mayer had eyesight problems, but was restarted in Europe a few years later after his eye surgery. Besides the stories, it included Pint-Size Pin-Ups paper dolls! I used to love paper dolls when I was a kid…I wonder how many copies of this issue got ruined when the kids cut out those paper dolls? This week, our US-6 roadtrip visits Colorado National Monument, another site administered by the National Park Service. For Day 32 of the journey, we also drive through canyons, into the desert...and ghost towns. We end the day in Utah, only three states from the end of the road. A lot of tourist attractions that we see today were not around in 1962. Many historical museums are newer, as history was simply not as big a topic 54 years ago. Amusement parks have changed considerably, with older, smaller parks closing and the modern theme parks mostly being constructed after 1962. Even Disney World was not around back then. The science centers and children’s museums we find in major metropolitan areas today are also all much newer. But nature was always an attraction, and our National Parks were spectacular back then, and they still are. On any roadtrip, including Roadtrip-’62 ™, the National Parks are my favorite sites. The National Park Service turns 100 years old on August 25, 2016, with more parks than we would have seen in 1962. There are currently 407 sites administered by the National Parks Service, including traditional scenery and natural features, historical parks, battlefields, cross-country trails, and even parkways built just for your roadtrip. The parks are hosting many special events this year to celebrate their 100th anniversary: you can check for one near you at Find Your Park. Even the U.S. Postal Service is celebrating the centennial by issuing 16 new stamps featuring national parks on June 2, 2016, such as the stamp for Arcadia National Park, shown above. Arcadia is just off highway US-1, near Ellsworth, Maine and also celebrates its 100th anniversary this year! The park was originally established as Sieur de Monts National Monument. It was the first eastern national park and the first created entirely by private donations of land. To find lots of great photos of vintage travel trailers, check out OldTrailer.com. They have photos, and many other resources for lovers of these mid-century wonders, including rallies, ads, technical tips and repair parts sources, and a discussion forum. They can inspire you, help you buy a trailer, repair it, and find a caravan of like-minded travelers for your roadtrip! On our US-23 roadtrip, we visited several National Parks, including Hopewell Culture National Historical Park near Chillicothe, Ohio. This site features fascinating ancient American Indian burial and ceremonial mounds and exhibits about the people who built them some 2,000 years ago. We stopped on the ninth day of our journey, en route from Columbus, Ohio to Portsmouth, Ohio. Come back and visit again. You might not think of National Parks in our nation’s capital, but Washington, DC has many sites that are part of the parks system. In addition to the Jefferson Memorial and Washington Monument, the entire Mall is a National Park. There are also the small Capitol Hill Parks near the Capitol itself, the various war memorials, the George Washington Parkway along the Potomac River, Kenilworth Park & Aquatic Gardens, hiking trails in Rock Creek Park, and many more sites. Use the old highways of US-1, US-29, US-50, US-211, or US-240 to get to Washington and see ‘em all! Most were here since at least 1962. Last time in the Roadtrip-'62 ™ e-newsletter, we took a look at highway US-44. These newsletters are free and are issued about once each month. I always highlight one US-numbered highway and a site along that road that we could have visited in 1962. Here’s a sneak peak on what you might see if you subscribe to the Roadtrip-'62 ™ e-newsletter, when I get up to US-93! Some roadtrips pass more national parks than others. A good highway for maximum exposure to the national park system is US-93. This 1346-mile, north-south highway almost reaches from Canada to Mexico, but falls just short of Mexico, ending at Wickenburg, Arizona. In 1962, it was even shorter, ending at Kingman, Arizona, with a state highway AZ-93 continuing south. 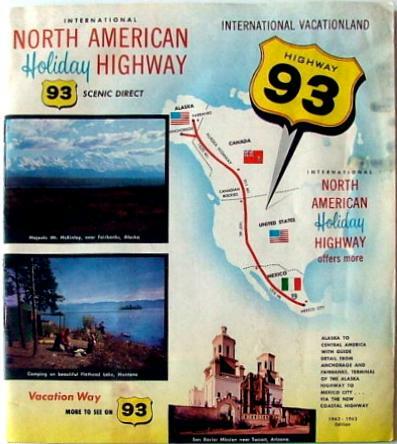 It also connects to highways numbered 93 in both Canada and Mexico, creating the “International North American Holiday Highway” shown on this brochure. But the portion of US-93 and US-60 between Las Vegas, Nevada and Phoenix, Arizona has recently been designated for upgrading to a new I-11 freeway, so US-93 will likely be shorter in the future. About the National Parks, beginning from the north, US-93 passes within 25 miles of Glacier National Park and it exits Montana about that far from Big Hole National Battlefield. Also at that point, it crosses both the Lewis & Clark and Nez Perce National Historic Trails. In Idaho, US-93 ALT goes right through Craters Of The Moon National Monument & Preserve and crosses the Oregon National Historic Trail. In Nevada, we pass Great Basin National Park, which includes what was Lehman Caves National Monument in 1962, and we cross the Old Spanish National Historic Trail. Finally, at the Arizona border, US-93 crosses Hoover Dam at Lake Mead National Recreation Area. National Trails Day - Saturday, June 4, 2016. Take a hike or volunteer to clean up a trail in your favorite National Park.